Scripture Songs for Worship : Psalm 30 "Joy Comes in the Morning"
Psalm 30 "Joy Comes in the Morning"
2 O LORD my God, I cried out to You, And You healed me. 6 Now in my prosperity I said, "I shall never be moved." 9 "What profit is there in my blood, When I go down to the pit? Will the dust praise You? Will it declare Your truth? 10 Hear, O LORD, and have mercy on me; LORD, be my helper!" Hi, the download button is located on the audio player below the video. I realy love the song how do i download? Hi, the download link is on the audio player below the video. Praise God! May His Word fill your heart and mind, Sara, and bless you abundantly. Any way of getting the sheet music to Joy in the Morning? Beautiful song. This is my favorite one of all! Praise the LORD for all your work! 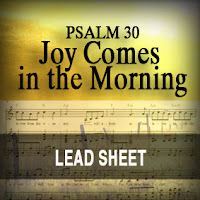 Sheet music Psalm 30 is now available :-) Blessings! Is there an accompaniment for this song, including the back ground vocals? May God Bless you and your family for your beautiful work! I love it! I also write music for the Psalms. Great Job! Keep up the good work. God bless.